The some what orderly solar cycles that have been observed for a little over three hundred years or so have ebbed and flowed producing some very intense solar maximum (Peak sunspot and solar activity) and sometimes almost not shown at all. The low intensity solar cycles, particularly when there has been a succession of them appear to have a connection with general climatic conditions on Earth. Periods such as the Maunder Minimum from about 1650 to 1715 saw very few reports of sunspots and coincided with the coldest part of the period known as the Little Ice Age. The absence of sunspots or a very active Sun in terms of sunspot activity seems to have very little observable change in total solar output; therefore a connection between sunspot activity and the Earth’s climate has struggled to gain credibility. The mechanism may not be entirely understood, but historic records of climate and sunspot activity seems to indicate a connection. The sunspot connection may at the very lest be a contributing factor as it may have been during the relatively recent Dalton Minimum. The Dalton Minimum was a period of low solar activity, lasting from about 1790 to 1820 that also coincided with a period of lower than average global temperatures. A determination of solar activity for the last 11,000 years has been made using the carbon 14 proxy record. Using the carbon 14 level records the sunspot number estimates have been pushed back as far as 11,400 years into the past. This determined record of solar activity sees a striking correlation between low solar activity and a series of well document cool climate periods during this time. These seemingly random periods of low sunspot activity may have more order and predictability than appears at first glance. An interesting paper written by I. Charvâtova in 1999 regarding Celestial Barycentrics (The orbital mechanics of the solar system) speculates about much longer duration cycles that impact on the behaviour of the sun and by extension the earth’s climatic conditions. Not generally appreciated is the fact the planets of the solar system do not actually orbit around the sun, they including the sun orbit around the centre of the solar system’s total mass. The Sun representing 99.8% of the total solar system’s mass orbits around a point very close to the centre, however it can be more than a Sun diameters from the central point. The mechanics of objects orbiting around the central point of the mass in a celestial system can be more clearly seen when the orbits of binary stars are observed. Take a two star system where both stars are identical in mass, both stars will orbit around a point half way between each other. Our sun is influenced by the distribution of the total solar system’s mass, but primarily by the positions of the four largest planets in order of mass, Jupiter, Saturn, Uranus and Neptune. The below plot the Sun’s position in relation to solar systems centre point over a fifty year period from 1945 to 1995 clearly shows the dynamics of this tug of war between the system heavy weights. See Fig. 1. It is in fact by observing the wobble of distant stars that astronomer are able to determine if that star has planets, the size of the planets and the orbit of the planets about the star. This technique is the method that has resulted in the discovery of all the so called exoplanets (Planets outside of our solar system) to date. Fig. 1: The sun's diameter is marked by a thick circle. The position of the centre of mass relative to the sun's centre marked by a cross and the respective years is indicated by small circles. The orbit of our Sun around the central and moving centre mass of the solar system generally forms a well ordered pattern referred to as a Trefoil. See below the pattern that is referred to as a Trefoil pattern. Fig. 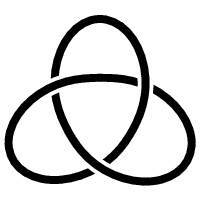 2: Trefoil pattern sometimes referred to as the trefoil knot. The Trefoil pattern or something resembling it is the norm and appears associated with long periods of relatively consistent solar cycles, however every now and then this pattern is disrupted and a period of disordered motion grips the Sun. This abnormal disordered period appears to be associated with less sunspot activity and generally lower temperatures here on Earth. The study by the author proposes that the 4 most influential planets orbiting around the our Sun produce a number of repeating cycles, a 2402 year cycle, a number of 178 year periods within the 2402 years, and a 370 year period also within the 2402 year cycle. They also reveal the order and chaos within the motions of the Sun around the centre of mass within these periods. The below diagram show the Sun’s path around the centre of mass of the solar system for defined periods of time starting in the year 1192 to the year 2134. The six upper plots show the Sun’s path in the orderly Trefoil type pattern. The lower five plots show the disordered path and the related grand minima that also saw temperature plunge on Earth. Fig. 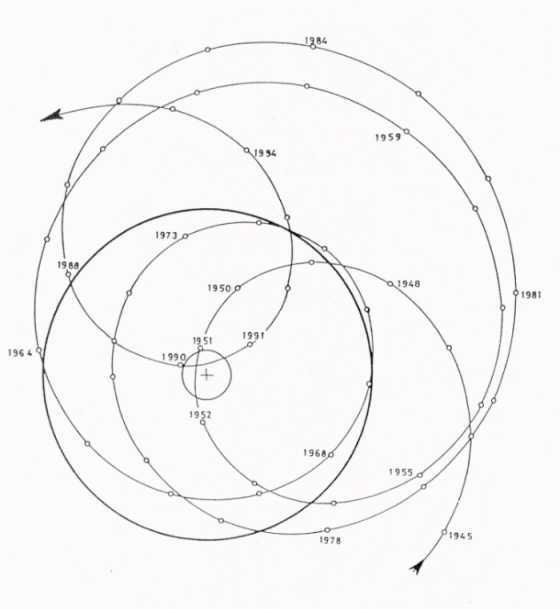 3: Diagram of the Sun’s path around the centre of mass of the solar system for defined periods of time starting in the year 1192 to the year 2134. Of interest to us right now is that we are entering (since 1985 and on going too until 2040) one of these periods of "disordered" motion. What is most interesting is that the last four "disordered" periods coincided with the "Wolf", "Sporer", "Maunder", and " Dalton " climate minimums. The table below clearly shows that while the grand minimums are not all that common they can however last some time. What’s this have to do with radio? The solar cycles clearly have everything to do with radio propagation as it is typically experienced on the HF and low VHF bands. However such long duration cycles that are at a minimum several generations in length are difficult to apply practically to ham radio operations. It is more a point of interest in the ongoing speculation of what the next cycle will bring and how this marvellous natural feature may in fact work! It is of particular interest with respect of the new cycle 24 and how it might develop with the view that we are well into a period of disordered motion as proposed in the author’s paper. We may have front row seats into a greater understanding of not only the solar cycles, but also to the effects on the Earth’s climatic conditions by the subtle affects of these solar cycles. A grand minimum would make the depressed HF conditions that we have been experiencing for 2008 the norm for the next generation or three. All this may be a bit depressing if you like me were looking forward to nice big solar max, but maybe we have more to worry about other than not seeing that fantastic F2 opening to Hawaii on six metre! If the past is any guide a grand minimum would likely disrupt food production, promote famines and for those living in the extreme northern and southern latitudes could be directly life threatening. The arguments proposed in Charvâtova’s paper are far from holding centre stage, however the test of time and observation will determine its place in our understanding of the relationship that the Earth and her occupants have with the greater universe. Cheers, Happy DXing and keep warm!